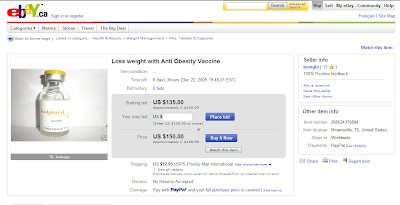 Weighty Matters: Bumglo's Anti-Obesity Vaccine. Yours via eBay for just $150. Bumglo's Anti-Obesity Vaccine. Yours via eBay for just $150. This just popped up on my eBay tracker and it was too stupid, I mean good, not to share. A user aptly named "Bumglo" has put up an "Anti-obesity vaccine" called "Sculptural Metabolize" that apparently will help you "Loss weight". This is a very special vaccine because unlike actual vaccines, the vial being sold is only a one month supply where you inject it into your own bum (not Bumglo's) twice a week for eight weeks. Bumglo is reporting it's safe, with hundreds of thousands of successful treatments worldwide. I guess doctors like me aren't actually selling it because it would certainly put us out of business. Someone should open up a Wikipedia page for Bumglo. Oh, and while you're at it, give a shout out to the Nobel folks too. Thank you Bumglo for curing obesity.